A panoramic view of the West Thumb Geyser Basin with Yellowstone Lake in the background. Several days of our Yellowstone vacation included exploring the various geysers and hot springs in the park. I had never seen them before, and they were nothing like I expected. There are several “geyser basins” (or areas where there are multiple hot springs and geysers in the same area) around Yellowstone Park, but there are only four or five in the entire world! We truly saw many unique areas, and things change there all the time. We could go again in 3-5 years, and things could look completely different. Being my first time at the hot springs, I was surprised at how stinky it was. There was a definite sulphur smell in the air. Steam was rising off many of the springs. I so badly wanted to feel just how hot they were, but I probably would have been burned – either from the heat, or the acidity. Either way, it’s also illegal, so I didn’t give in to the temptation to touch the water (or let anyone else in the group). Some of the springs were so clear, you could see every detail of the pool, quite deep. Several looked like you could dive in, swim down, and find The Little Mermaids grotto of treasures below! The clarity and colors in many of the hot springs across the park were incredible! I think that deep down, I thought the photographs I had seen were doctored in some way. This was not the case! The colors were so bright; it was amazing! 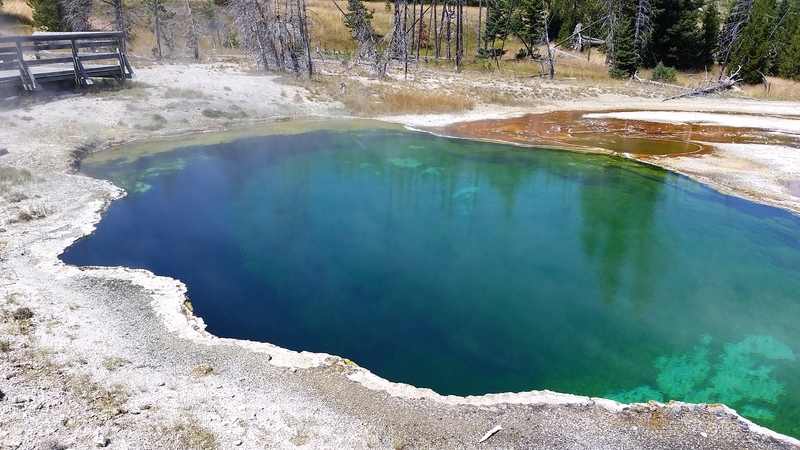 Colors were caused by the chemical makeup of the springs, the depths, the temperatures, the bacteria and microorganisms that were living in it, and the minerals left behind in the run-off. Speaking of run-off, many of the springs in this area literally emptied into Yellowstone Lake or rivers in the area. 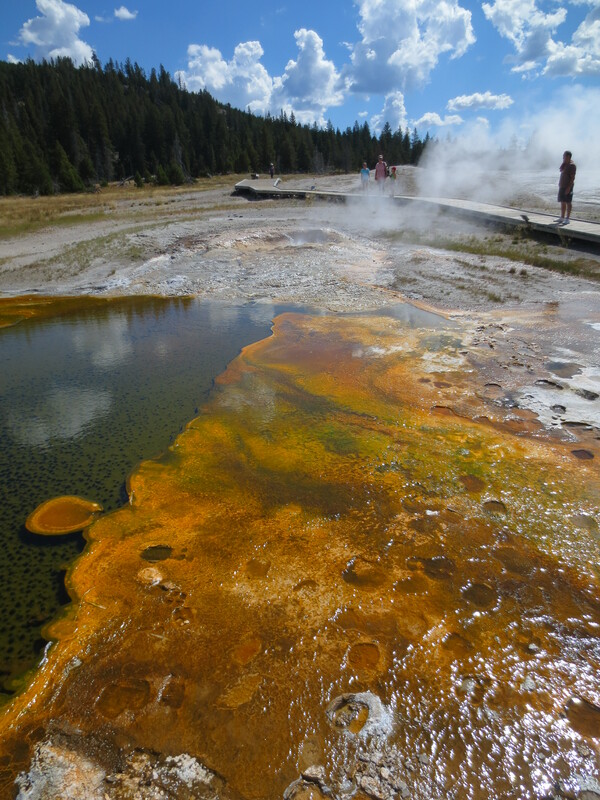 The orange solid surrounding many of the pools are called “bacteria mats”. They are made up of living microorganisms. Besides the colors, I didn’t expect the ground all around the geyser basins to be thermal as well. That means the ground all around was also hot, some areas only having a thin layer of ground above underground springs. There were several areas where we could see recent sink holes, or where vegetation was obviously being impacted by acidic or thermal activity under the soil. In some areas, we could feel the heat rising from the ground, and often were greeted by hot steam from the geysers or hot springs. There were signs all over, reminding us to stay on the paths. Nikolai and I often wondered how they knew where it would be safe, and how they anchored the walkways so as not to collapse with new sinkholes. We also noticed buffalo prints and dung near many of the hot springs, and wondered how people could fall through, but not the huge bison!?! I’ll have an upcoming post about the various areas we explored in the geyser basin and hot springs. Join Sarah and her family’s adventure into Yellowstone National Park. Her pictures are breathtaking.